The Interfit 30cm Silver/White 30cm On-Lens Reflector STR112 is great for portraits and very portable. 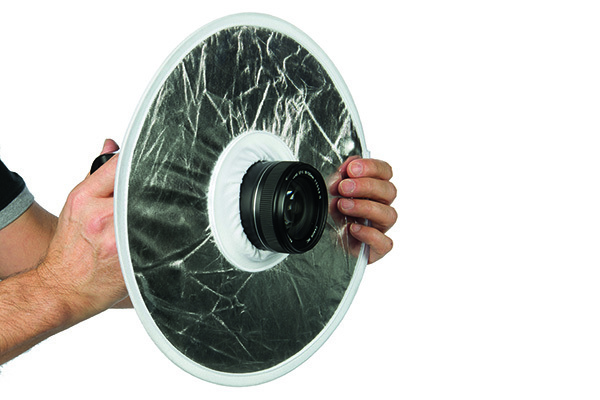 This rather cool reflector – the Interfit 30cm Silver/White 30cm On-Lens Reflector STR112 – is a bit different to your average model, as it fits around your camera lens thanks to an elasticated hole in the centre. This is perfect for those situations where you don’t have a spare hand, plus it also creates a great catchlight if shooting portraits. You can use this in natural light or with bounce flash. The disc folds neatly down to just 11cm in diameter, so it’s easy to pop into your gear bag.